What Is The Best Nakiri Knife? 3 Nakiri vs Usuba vs Santoku: How Different Each Style Is! Do you love to make nori rolls, kappamaki, and katsuramuki vegetable sheets? Would you prefer to have a reliable knife that can cut the veggies paper-thin in a few seconds, without taking away their color and flavor? If you are positive for any of these two situations, a Nakiri knife can be your best friend in the kitchen at any point in time. It is an elite Japanese vegetable cleaver designed exclusively for working with seedless vegetables. Its name indicates what is needed: ‘na’ refers to leaf and ‘kiri’ means cutting. For fulfilling the requirement of thinnest possible cutting, it is obvious to look for the best Nakiri knife. Nakiri knives are double bevel cleavers with razor sharp taper edges, squared off tips, and flat design profile. Such a profile makes them perfect for push cutting and chopping, although not for rock cutting because it is not possible to rock the blade due to straight edge. These knives are usually ground thin for ensuring optimal performance via an advanced cutting edge. Here is a table summarising some the best selling models. According to several Nakiri knife reviews, a Nakiri features a hollow ground blade that is as skinny as a chef’s knife and is made up of carbon steel for cutting vegetables, particularly when it is essential to have finesse. It usually has a flat edge just as a slim cleaver, up-and-down motion functionality without horizontal pulling or pushing. Due to a flatter edge, it becomes easier to retain uniform thinness at the time of peeling even hard veggies or fruits. Nakiris are effective performers for mincing, chopping, and slicing any vegetable or fruit, with speed and precision, to have thinnest possible or perfectly little outcome in the form of cubes or slices. Considering the angle of the blade, it is sharper than the blades of other knives. Similarly, the carbon steel build makes the knife more durable than Asian knives. The width of the blade is usually thicker, which contributes to strength at the time of slicing hard stuff such as turnips. Best Nakiri knives usually have a Granton edge that is hollow enough to form air packets between the slice and indentations, which keeps sticking of fruit or vegetable under target, at bay. Further, because Nakiris are dedicated to fruits and vegetables, there is no issue of bacterial cross contamination. Another notable feature is the full tang design of stainless design, which means single piece of steel lies across from the tip to the handle’s end. The polymer triple-riveted handle prevents moisture to accumulate between the blade and handle as well as prevents bacteria between the steel and handle. Consider the best Nakiri knife for having consistent pieces for salads and soups as well as strips for stir-frying, with more cutting precision and less cleanup than a food processor. Nakiri vs Usuba vs Santoku: How Different Each Style Is! While a Nakiri comes with a double-bevel blade sharpened on both sides, a Usuba features a single-bevel blade sharpened on one side just as a conventional Japanese cutlery. The blade is thin but robust in case of a Nakiri, but a Usuba has a delicate edge and is a more special cleaver for decorative cutting. Further, a Nakiri is ideal for both left- and right-handers, while Usuba is suitable for either of the two. A Nakiri has comparatively shorter handle but is affordable, while a Usuba is costlier. A Santoku is more of a general-purpose kind mastering in mincing, dicing, and slicing. The blade is shorter than a Nakiri but features a flat edge like a Nakiri. However, the distinct point is that a Nakiri has a sheep’s foot blade curving at 60 degrees with the spine drawn down to the front, offering a linear edge and restricted rocking functionality similar to a Chef’s knife. With a few exceptions aside, Santoku lack bolster and often come with a Granton edge just as Nakiri to ensure uniform thickness from blade to spine. The difference between a Nakiri and Santoku actually is a matter of utility and personal preference. 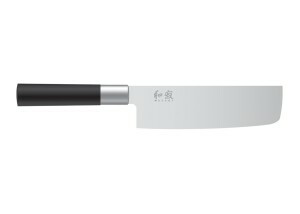 A chef uses a Santoku as a primary knife, at times; whereas a Nakiri is a more specialized cleaver for dealing with vegetables. Further, for those with a rocking style for cutting, a bit upturned Santoku is ideal, as it can be rocked somewhat towards the stroke’s end. At t he end, both are perfect on the cutting board or table. As per the maximum positive Nakiri knife reviews, here are the best Nakiri knives to choose from, as per your requirements and budget. This Nakiri knife is perhaps a choice of both professional and home chefs who prefer a high quality, durable, sharp, and easy to maintain knives. It features a blade made up of chrome-molybdenum-vanadium steel for ensuring durability lasting for years. Its excellent strength is the result of laser cut via just one piece of high carbon steel. You can expect matchless sharpness as well as 30% more retention of longer blade, because of the implemented Precision Edge Technology. This also ensures high resistance to external elements such as stains and odor. The handle is ergonomic and is built out of lasting synthetic polypropylene material. It is capable of extending until the end of visible tang. There is also a bolster acting as a finger guard for a balanced feel. Click here to buy this knife on Amazon! Most pros and features of the aforementioned Gourmet version are also applicable here. However, the most distinct point of this knife is that it comes with the flexibility of a pure cleaver exclusively made for vegetables as well as with the features of a chef’s knife. This Classic knife features a no-stick blade with edge in Granton style, sloping on both sides so that you can chop and slice well. Its blade is 30% sharper as well as retains the edge longer than any usual blade in Asian style. The edge, while cutting, generates air pockets due to which the vegetable or fruit being cut is released easily. The knife is constructed using the precision forged technology and high-carbon no-stain steel. Talking about its handle, it is wrapped up to the full tang, which delivers maneuverability and superior balance. 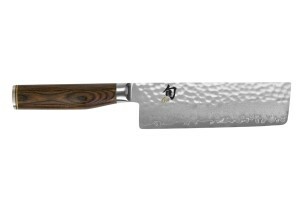 This one is perhaps an all-purpose Nakiri knife having a conventional Japanese style for chopping veggies nicely and quickly. It is made up of Daido 1K6 high-carbon no-stain steel that is capable enough for retaining superb edge retention. Talking about the blades, they are bead-blasted for a pretty finish. Although a conventional blade-style, the knife has a distinctly modern handle made up of polypropylene and bamboo powder and soaked in an antibacterial agent for 100% clean preparation of veggies. At the given price, the sharpness is just scary although superb for cutting and that the combination of sharpness level and perfect balance enable easy and quick slicing and dicing. This is another slim, dynamic, and ultra-sharp Nakiri to consider, as per many Nakiri knife reviews. Its 5.5-inch blade slides smoothly through fruits and veggies. Layered with Damascus steel that adds to its strength, the manual finish contributes to its beauty as well as facilitates hollow-ground feature. Such a build prevents sticking as well as alleviates dragging. The blade features VG10 steel, dressed with 16 Damascus layers on either side and then beveled for superb precision and lateral stability. Coming to the look and design, the elegant Pakkawood in walnut finish forms the handles that appear quite stylish. Further, they are shaped smartly to fit into your palm in different comfortable and safe grips. This one has almost the same pros and features of the Premier knife but with a few differences. First, it is a bit longer and has blades with a 16-degree angle, delivering maximum sharpness as compared to the conventional European blades. Apart from strength and flexibility, the knife’s metal ensures resistance to corrosion. Further, the knife is available in D-shaped style or in reverse D-shaped style to ensure comfort and control. Its Pakkawood handles are NSF certified for commercial use.